Q: What will be done with all of this information from the “Our Town Planning” meetings? A: The information will be collected through May 10th and analyzed by Town staff (May 12th-16th). 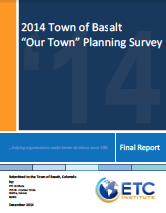 The information will then be submitted to Basalt Town Council. For more information, see Timeline. Q: Where can I see the current meeting results? What did others come up with? A: As we collect the meeting results we will be posting them on the Results webpage. Q: Who is being included in this planning process? Who’s voices will be heard? A: We are meeting with just about everyone, including: anglers, architects, artists, Basalt Chamber of Commerce, contractors, designers, lodge owners, realtors, residents, restaurant owners, retail owners, and the Roaring Fork Club owners. To see what meetings are currently scheduled, see the Meeting Schedule webpage. Q: Is Basalt’s younger generation participating in this planning process? A: Yes! We had several meetings with the Basalt Schools and Youth Entity. For specific dates and times, see the Meeting Schedule webpage. Q: How can I participate in the “Our Town Planning” process? A: There are still ways for you to participate in the “Our Town Planning” process. See Chat Session Meeting Notes. See current “Our Town Planning” drawings. Watch the “Our Town” Summary Findings Meeting video.